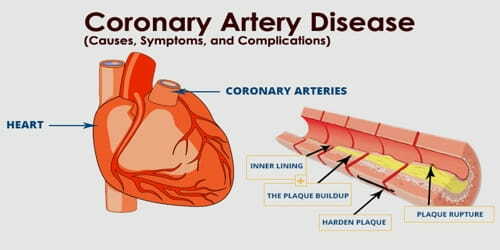 Definition: Coronary artery disease (CAD), also known as ischemic heart disease (IHD), is the narrowing or blockage of the coronary arteries, usually caused by atherosclerosis. Types include stable angina, unstable angina, myocardial infarction, and sudden cardiac death. Atherosclerosis (sometimes called “hardening” or “clogging” of the arteries) is the buildup of cholesterol and fatty deposits (called plaques) on the inner walls of the arteries. These plaques can restrict blood flow to the heart muscle by physically clogging the artery or by causing abnormal artery tone and function. In many cases, the first sign is a heart attack. A common symptom is chest pain or discomfort which may travel into the shoulder, arm, back, neck, or jaw. Occasionally it may feel like heartburn. Usually, symptoms occur with exercise or emotional stress, last less than a few minutes, and improve with rest. Shortness of breath may also occur and sometimes no symptoms are present. 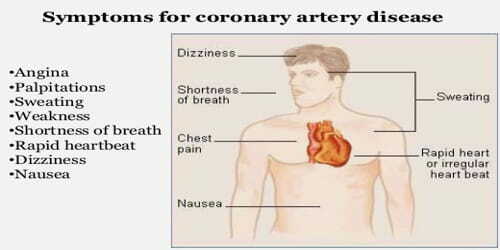 Coronary artery disease (CAD) often develops over decades; people might not notice a problem until they have a significant blockage or a heart attack. But there are plenty people can do to prevent and treat coronary artery disease. A healthy lifestyle can make a big impact. Causes, Signs, and Symptoms: The most common cause of CAD is a vascular injury with cholesterol plaque buildup in the arteries, known as atherosclerosis. Reduced blood flow occurs when one or more of these arteries become partially or completely blocked. Sometimes, the blood clot breaks apart, and the blood supply is restored. 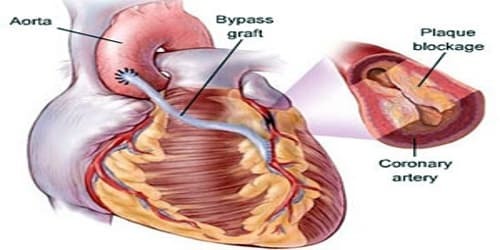 In other cases, the blood clot (coronary thrombus) may suddenly block the blood supply to the heart muscle (coronary occlusion), causing one of three serious conditions, called acute coronary syndromes. If any persons coronary arteries narrow, they can’t supply enough oxygen-rich blood to their heart — especially when it’s beating hard, such as during exercise. At first, the decreased blood flow may not cause any coronary artery disease symptoms. Angina (chest discomfort) is the most common symptom of CAD. Women are somewhat more likely than men are to experience less typical signs and symptoms of a heart attack, such as neck or jaw pain. Sometimes a heart attack occurs without any apparent signs or symptoms. Rick factors and Complications: Coronary artery disease (CAD) has a number of well-determined risk factors. These include high blood pressure, smoking, diabetes, lack of exercise, obesity, high blood cholesterol, poor diet, depression, family history, and excessive alcohol. About half of cases are linked to genetics. Smoking and obesity are associated with about 36% and 20% of cases, respectively. The risk for CAD also increases with age. Based on age alone as a risk factor, men have a greater risk for the disease beginning at age 45 and women have a greater risk beginning at age 55. The risk of coronary artery disease is also higher if any people have a family history of the disease.